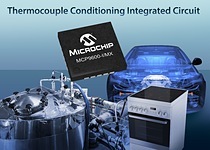 Microchip announced the MCP9600--the world's first thermocouple-conditioning integrated circuit to combine precision instrumentation, a precision temperature sensor and a precision, high-resolution analog-to-digital converter (ADC), in addition to a math engine preprogrammed with the firmware to support a broad range of standard thermocouple types (K, J, T, N, S, E, B and R). Thermocouples are widely used to measure temperature by the designers of industrial, consumer, automotive/aerospace and petrochemical applications, among others. Microchip\'s MCP9600 provides them with the world’s first plug-and-play solution for creating thermocouple-based designs, because it eliminates the design expertise required for a discrete implementation, such as firmware development using an MCU’s math engine. Microchip\'s MCP9600 is the world’s first thermocouple-conditioning integrated circuit to combine precision instrumentation, a precision temperature sensor and a precision, high-resolution analog-to-digital converter (ADC), in addition to a math engine preprogrammed with the firmware to support a broad range of standard thermocouple types (K, J, T, N, S, E, B and R). CHANDLER, Ariz. — Microchip Technology Inc. (NASDAQ: MCHP), a leading provider of microcontroller, mixed-signal, analog and Flash-IP solutions, today announced the MCP9600—the world’s first thermocouple-conditioning integrated circuit to combine precision instrumentation, a precision temperature sensor and a precision, high-resolution analog-to-digital converter (ADC), in addition to a math engine preprogrammed with the firmware to support a broad range of standard thermocouple types (K, J, T, N, S, E, B and R). Thermocouples are one of the most ubiquitous temperature-measurement devices, due to their robustness and accuracy in harsh, high-temperature environments, and their ability to measure temperature over an extremely wide range. 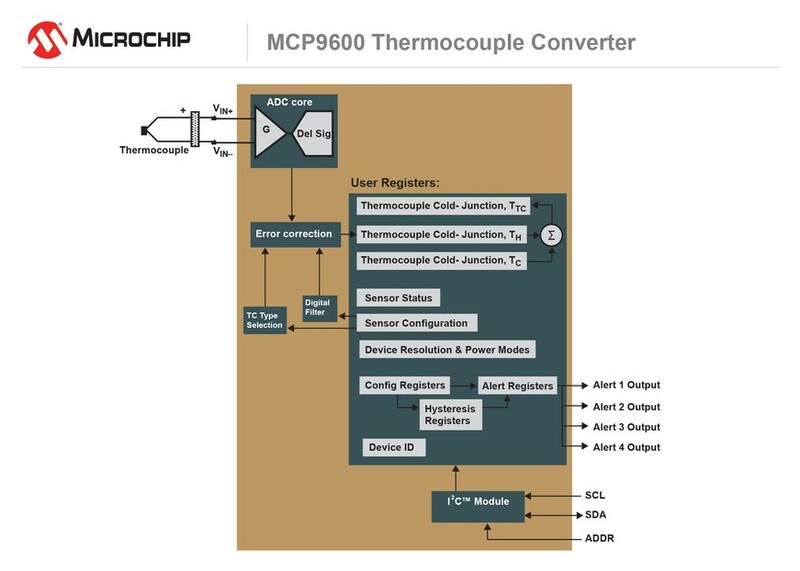 The MCP9600 simplifies thermocouple designs by integrating a number of discrete devices into one chip, which also lowers board area, cost and power consumption. Thermocouples are widely used to measure temperature by the designers of industrial, consumer, automotive/aerospace and petrochemical applications, among others. 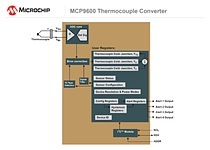 The MCP9600 provides them with the world’s first plug-and-play solution for creating thermocouple-based designs, because it eliminates the design expertise required for a discrete implementation, such as firmware development using an MCU’s math engine. Designers no longer have to create precision instrumentation circuitry to accurately measure a thermocouple’s microvolt-level signals, nor do they have to design ADC circuitry for precise temperature calculations. With the MCP9600’s integrated cold-junction compensation, calculating the “Hot” junction temperature of a thermocouple doesn’t necessitate thermal design expertise to precisely measure the reference temperature of the thermocouple’s “Cold” junction. Other features of the MCP9600 include a temperature-data digital filter, which minimizes the effects of temperature fluctuations, system noise and electromagnetic interference. Its shutdown modes reduce overall system power consumption, while its four user-programmable temperature-alert outputs reduce the system microcontroller’s overhead and code space, while further simplifying designs. Finally, the MCP9600 comes in a 5x5 mm, 20-lead mQFN package, which further reduces board area and manufacturing cost. The MCP9600 Thermocouple IC Evaluation Board (part # ADM00665) was also announced today, to enable development. It is available now for $65.00. The MCP9600 is available today for sampling and volume production, in a 5x5 mm, 20-lead mQFN package. Prices start at $3.54 each in 5,000-unit quantities. For additional information, contact any Microchip sales representative or authorized worldwide distributor, or visit Microchip’s Web site at www.microchip.com/MCP9600-Page-063015a. To purchase products mentioned in this press release, go to microchipDIRECT or contact one of Microchip’s authorized distribution partners. Microchip Technology Inc. (NASDAQ: MCHP) is a leading provider of microcontroller, mixed-signal, analog and Flash-IP solutions, providing low-risk product development, lower total system cost and faster time to market for thousands of diverse customer applications worldwide. Headquartered in Chandler, Arizona, Microchip offers outstanding technical support along with dependable delivery and quality. For more information, visit the Microchip website at www.microchip.com/Homepage-063015a.